1 of 1 Heat oven to 350 degrees F. Line a 13 x 9 x 2-inch baking pan with nonstick foil. Set aside. 1 of 2 In a blender, combine 1 1/3 cups water, the bananas, egg whites and oil. Blend until smooth, about 1 minute. 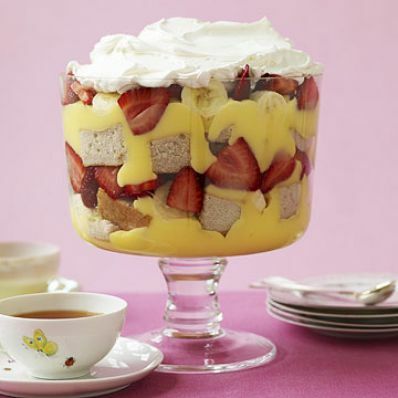 Place cake mix in a large bowl and add mixture from blender. With an electric mixer, beat on low speed for 30 seconds, then increase speed to high and beat 2 minutes. Pour into prepared pan and bake at 350 degrees F for 33 to 35 minutes. 2 of 2 Cool cake in pan on a wire rack for 15 minutes, then, using foil, lift cake from pan and cool completely. 1 of 3 Meanwhile, cook pudding mix with milk for 15 to 20 minutes over medium heat, until thickened and bubbly. Transfer to a bowl and refrigerate 30 minutes. 3 of 3 3 hours or overnight.